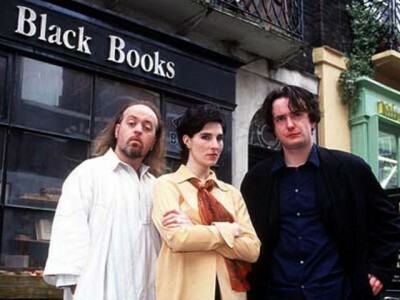 Black Books was a Channel 4 sitcom about book shop starring Dylan Moran, Bill Bailey and Tamsin Grieg. Andy Riley and Kevin Cecil wrote eight of the eighteen episodes that were made, including ‘Party’ which won the BAFTA for best sitcom in 2005. Here’s a clip from that episode. Fran has instructed Manny never to tell Bernard that his old fiancee is actually alive. Will he manage to stay quiet? This is Manny (Bill Bailey) in the episode ‘Manny Come Home,’ in which he briefly works for the shiny modern book shop next door – for the sinister Evan, played by guest star Simon Pegg.